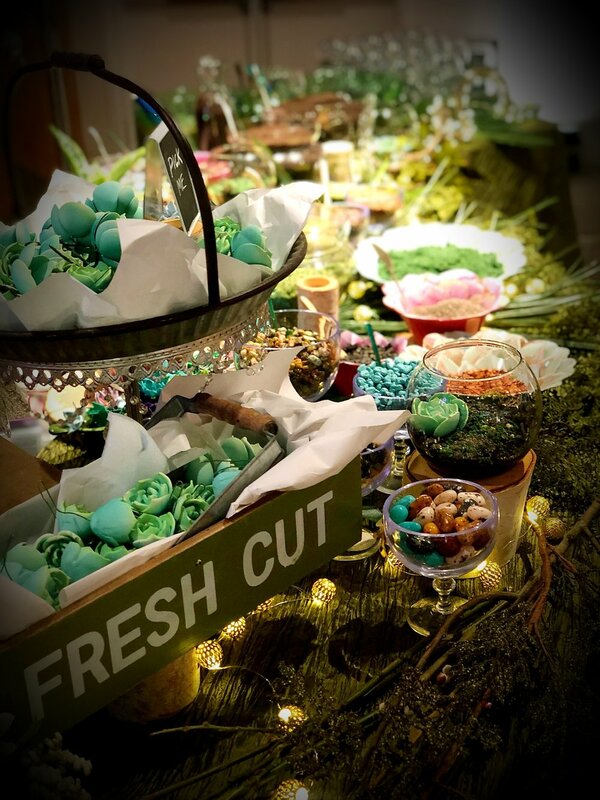 You can be the Willie Wonka of the 21st century, as you welcome guests into a wonder world of edible enchantment, with Vita Perfetta’s Edible Terrariums. Glass-encased plants have never looked so good, and they’ve never tasted this good either! We’ve traded Gobstoppers, Nerds, and Laffy Taffy for cupcakes, chocolate rocks, and brown sugar sand. Choose your landscape preference: a desert delight or a sea-styled satisfaction, and let us show you and your guests how to bake the most delicious decor you’ve ever seen. Highly customizable, the desert dessert starts with a layer of chocolate colored rocks and cacao nibs. Next is a dusting of devil’s food cake, a crumbling of crushed Oreos, or a downpour of chocolate sprinkles. And to finish it off, a cactus you can crunch on: green fondant succulents! Ommpa Loompa doopity don’t forget about the sea-style terrarium! This is seafood redefined! Layers of soft brown sugar sand topped with white chocolate seashells and sparkly pearls come together to create a miniature aquatic atrium, minus the water (but double the fun).